Shapers Ultra Fused Carbon – Proudly engineered by Shapers Composites Co.
Shapers Ultra Fused Carbon is a product of using the highest grade carbon tow together with a engineered high strength webbing system, that is designed for bonding and increasing the interlaminar strength between foam and composites. The high strength web backing goes completely transparent when wet out with resin and is compatible with polyester and epoxy resins. 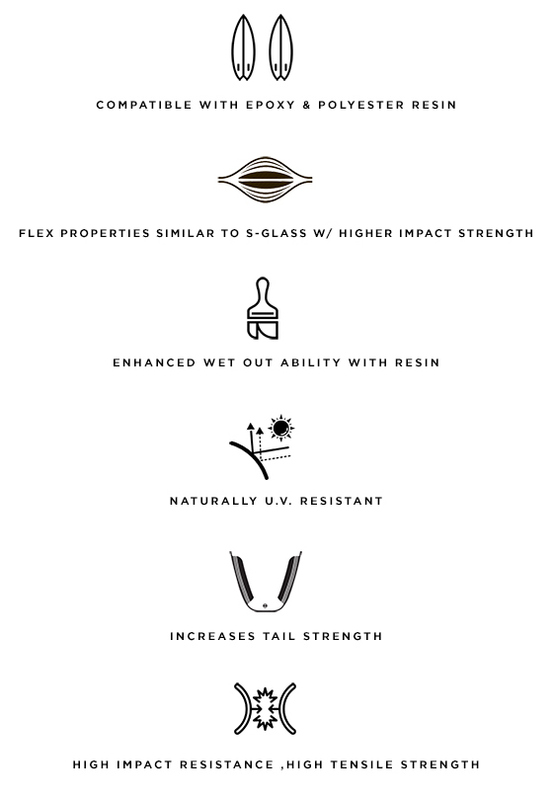 The major benefit we were seeking with Shapers Ultra Fused Carbon was to create a product that could be laminated completely flat in prominent areas such as centre strips down the surfboard, increase tensile strength and not add weight. In other words, Shapers Fused Carbon does not leave a raised edge as some woven tapes and prevents resin build up, sand through and raised lumps in resin work created by some woven products. Please note: Ultra Fused Carbon cannot be curved like woven tapes and is therefore it is optimal for straight layups. For best result simply applies directly between foam and fibreglass. Common practice of applying Shapers Ultra Fused Carbon to foam is to brush a thin layer of resin under the Ultra Fused Carbon or specialised clear adhesive spray. Basalt fibres are made from crushed Basalt rocks, which is one of the most commonly found volcanic rock in low to mid lining coast areas. Basalt in considered as an environmentally friendly product, as there no other materials required manufacture and does not need to be treated like other fibres. The manufacturing process is simple, Basalt is sourced, then washed, crushed, melted and then extruded into fibres. Basalt is a great alternative for manufactures that want more tail flex without compromising the natural flex of the foam, also with out loosing integrity of impact and tensile strength. Manufactures place the Basalt Hybrid Tapes on the back rail of surfboards to prevent the tails from shattering and strengthening the deck from foot compression's. The Basalt Hybrid Tapes are also used on the bottom of the surfboards to create additional spring or pop out of the board. This is known as a kinetic flex, as the board is place under pressure while in transition, during or out of a turn the board springs back to its natural curvature and delivers additional speed. The Basalt Hybrid Tapes are often used along the full length of the surfboard rail with stringer-less surfboards. This is to add additional strength or to replace the strength that a timber stringer would provide, therefore creating a Parabolic Frame. The Parabolic Frame helps prevent the board from twisting which increases the liveliness/responsiveness, this also creates a parabolic flex pattern that allows to board to deliver more drive, speed and power. The Basalt Hybrid Tapes are used during the lamination process. The tapes are place on the foam before the cloth is laminated. Most manufactures mark the area they wish to place the Basalt Hybrid Tapes, and brush a small amount of resin on the foam (to prevent to the Basalt Hybrid Tapes from moving). The Basalt Hybrid Tapes are then placed on the resin (making sure the resin has soaked through) and then continue to lay the cloth over the board and laminate as normal. The Basalt Hybrid Tapes are compatible with both Epoxy and Polyester Resin.